The trailer for Thunder Road is a force of marketing nature. The trust instilled in the audience to come along for the ride is impressive and pushes narrative convention at every scene change. Cummings opens the trailer by warning the audience (embodied by his daughter that he’s not good at “this” – literally the this he is talking about patty cake, figuratively he might be talking about the marketing space of trailer cutting). Like Magnolia playing out the ensemble through one character we sit in the one scene for the rest of the trailer from 27 seconds to 1:41 with audio from this one confrontation but clips from all over this movie. When you see trailers for indies you often see so many tropes played straight that sometimes I cannot finish them. This one plays closer to a short. Maybe since it was based on the short from 2016. The controlled master shot on Jim Cummings delivering the eulogy is a moving testament to pure filmmaking. But he can handle edits too and the dynamic nature of who this character is outside of this eulogy. So why mess with this narrative tour de force? Well, obviously to get more of a good thing. But as when scaling anything the architects of scaling must have a deep knowledge of the subject matter, genre, rules of the craft and the goal of the piece of work (art). 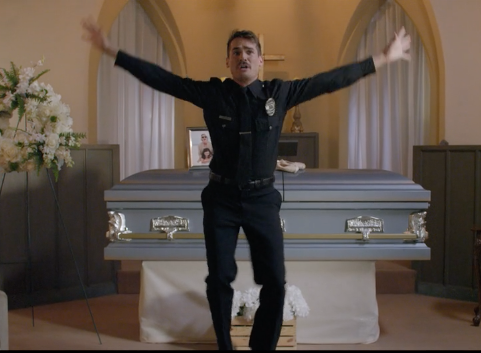 I think this trailer for Thunder Road is the best Trailer of the year and I look forward to seeing if anything can match the depth of emotion and wonder that I felt watching this. My only note would be to digitally remove the #stache.